William Augustus Bowles (1763–1805), also known as Estajoca, was a Maryland-born Loyalist officer during the American Revolution, and later English adventurer and organizer of Native American attempts to create their own state outside of the control of the United States, Spain, or Great Britain. Some sources give his date of birth as 1764. Bowles was born in Frederick County, Maryland, and joined the Maryland Loyalist Battalion at the age of thirteen with the junior officer rank of Ensign, travelling with the battalion when it was ordered to form part of the garrison of Pensacola. Upon arrival, and as he was an officer, Bowles resigned his commission, and left the fortifications. He was captured by Indians from the Creek Nation. While he was living with the Creek Tribe, Spanish naval forces with soldiers embarked upon their ships, and began to attack British forts along the Gulf Coast. Bowles convinced the Creeks to support the British garrison of Pensacola against the Spaniards, but the garrison fell when the powder magazine at the fortress was hit by artillery fire from the Spanish ships. The survivors of the garrison were captured, but Bowles escaped into the wilderness with his Creek allies. This occurred May 9, 1781, when Bowles was either 16 or 17 years old. After this battle, he was reinstated in the British Army, and went to the Bahamas. After a few months in the Bahamas, the British governor Lord Dunmore, sent Bowles back among the Creeks with a charge to establish a trading house among them. Bowles established a trading post along the Chattahoochee River. He would marry two wives, one Cherokee and the other a daughter of the Hitchiti Muscogee chieftain, William Perryman, and used this union as the basis for his claim to exert political influence among the Creeks, later styling himself "Director General of the Muskogee Nation". 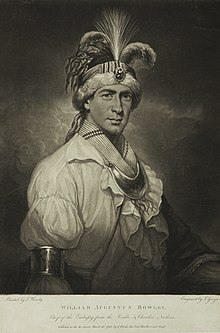 Mixed marriages were common among the Seminoles and Creeks according to historian James Leitch Wright, but historian Kevin Mulroy says he disagrees strongly with Wright's contention..
Pursuing his idea of an American Indian state after the end of the Revolutionary War, he was received by George III as 'Chief of the Embassy for Creek and Cherokee Nations' and it was with British backing that he returned to Florida. In 1795, along with the Seminoles, he formed a short-lived state in northern Florida (part of Spanish East Florida) known as the State of Muskogee, with himself as its "Director General." After designing a flag and constitution for his state, Bowles raised an army and began to carry out raids of Spanish territories in Florida. In 1800, he declared war on Spain. Bowles operated two schooners and boasted of a force of 400 frontiersmen, former slaves, and warriors. A furious Spain offered $6,000 and 1,500 kegs of rum for his capture. When he was finally captured, he was transported to Madrid where he was unmoved by King Carlos IV's attempts to make him change sides. He then escaped, commandeering a ship and returning to the Gulf of Mexico. One of the main victims of his piracy was the trading firm of Panton, Leslie & Company. In 1803, not long after having declared himself 'Chief of all Indians present' at a tribal council, he was betrayed and turned over to the Spanish. William Augustus Bowles died in 1805, at Castillo Morro, in Havana, Cuba, having refused to eat. ^ Din, Gilbert C. (2004). "William Augustus Bowles on the Georgia Frontier: A Reexamination of the Spanish Surrender of Fort San Marcos de Apalache in 1800". Georgia Historical Quarterly. 88 (3): 305–337. Retrieved 15 February 2018. ^ Jane G. Landers (1 June 2010). ATLANTIC CREOLES IN THE AGE OF REVOLUTIONS. Harvard University Press. p. 113. ISBN 978-0-674-05416-5. ^ Gregory A. Waselkov (28 September 2009). A Conquering Spirit: Fort Mims and the Redstick War of 1813-1814. University of Alabama Press. pp. 57–. ISBN 978-0-8173-5573-9. ^ James Leitch Wright (1986). Creeks & Seminoles: The Destruction and Regeneration of the Muscogulge People. U of Nebraska Press. p. 80. ISBN 0-8032-9728-9. ^ Kevin Mulroy (September 2003). Freedom on the Border: The Seminole Maroons in Florida, the Indian Territory, Coahuila, and Texas. Texas Tech University Press. pp. 186–. ISBN 978-0-89672-516-4. ^ Landers, Jane (2010). Atlantic Creoles in the Age of Revolutions. London: Harvard University Press. p. 102-103. This page was last edited on 20 November 2018, at 00:46 (UTC).